Advanced craftsman shorts made of selected 4-way stretch materials for ultimate comfort and freedom of movement. Designed with influences from sports. Thigh panels and back part of 4-way ripstop stretch for high durability. 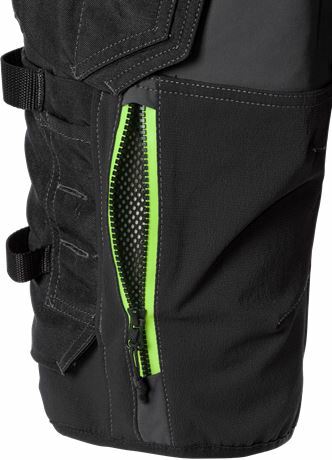 Leg pockets with ventilating mesh at openings, can also be used to let out excess heat. Extra comfortable waist and mobile phone pocket of stretch material for easy access. Material: 55% elastomultiester, 45% polyester. Stretch rip stop fabric 88% polyamide, 12% elastane. Weight: 218 g/m², stretch rip stop fabric 260 g/m². 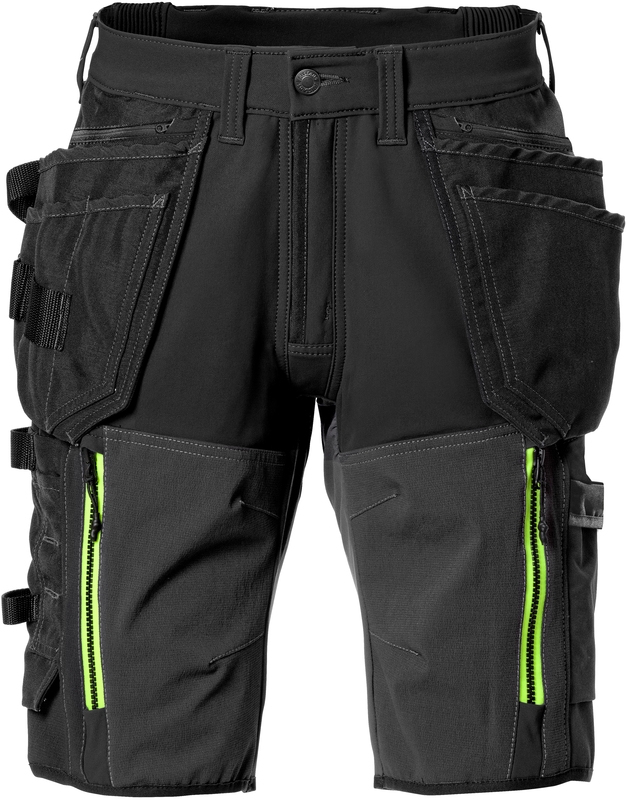 4-way stretch fabric / Thigh panels and back part of 4-way ripstop stretch material / Stretched rib part at waist / 2 CORDURA® reinforced loose-hanging pockets, 1 with 3 smaller pockets, tool loops and 1 zip pocket, 1 with extra pocket and 1 zip pocket / D-ring under loose hanging pocket / 2 front pockets / Rubber button / Double reinforced crotch seam / Hammer loop / 2 back pockets with zip / 2 thigh pockets with zip and ventilation panels inside / Folding rule pocket with tool pocket, pen pocket, button and loop for sheath knife in CORDURA® / Leg pocket with mobile phone pocket / Elastic bindening.